The construction work is finished! 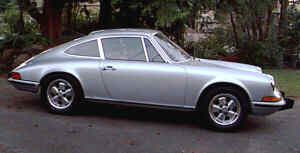 Project P9311 is now, as of December 2, 1996, the EPorsche. For all the gory details, see the diary. On December 3rd, I called my agent and had the insurance fully activated. On December 11th, using a 3-day Washington Trip Permit, $13, I made the first "real" road trip up to the Washington State Patrol Inspection Station, fortunately only a few miles away, to get the car certified as an electric vehicle. On December 12th I got it licensed and got new plates. We're officially on the road again! I get a credit on my 1996 income taxes, too! Performance is tolerable, about that of a '53 VW bug running on three cylinders, but the range is awful. Maybe nine miles with careful driving and avoiding major hills. And there seem to be hills everywhere I want to go. Never paid any attention to them before. On January 7th, 1997, I decided to add an additional battery and on 16th I upped it to two batteries. They will be installed in the engine compartment. The first modification project, the 120 volt upgrade, has begun. What fun! As of March 2, 1997, the 120 volt upgrade is complete and the car is once again drivable. With the added weight in the engine compartment, the rear end is a bit over an inch lower than it was before. The front end has been adjusted down accordingly. Over all, the car is about 1½" lower than specifications. Someday it would be nice to get the car into the Porsche dealer to have the ride height set and the wheels aligned. Road tests on my standard hilly loop gave 9.3 miles. Before the 120 volt upgrade, a test on this loop yielded 7.1 miles. The range should improve as the batteries get broken in and the weather warms up. Performance is much improved, especially on the hills. The shift point is up to around 4000 rpm vs. about 3000 rpm before the upgrade. Had problems with the Ground Fault Interrupter (GFI) tripping during charging. This is caused by charging current leaking from the battery circuit to the car frame. For safety, the frame connects to the house electrical ground via the charger's AC power cable. It wasn't possible to clear the problem by cleaning the batteries. Voltage tests showed that the main leakage path was in the front battery box. There was acid in the bottom of the box making a circuit to the frame via the lag bolts securing the box to the rack. The batteries were removed, the acid was cleaned out, the lag bolts were removed, the lag bolt holes were filled and the bottom of the box was repainted. Battery #3 was found to be leaking acid and was replaced. Then the batteries were put back in. On March 20, 1997, the charger was put on without any problems. Hooray! The problem came back after a few more charges. Rats! Disabled the GFI by isolating the ground at the outlet. Its not that unsafe! After driving for a 100 miles or so I am beginning to get a feel for the batteries. The check point is the battery voltage at 200 amps, the "cruising" current. This voltage stays near 110 volts for a relatively long time, gradually dropping. When it gets to about 100 volts, it begans to drop fairly rapidly. When it gets to 70 to 80 volts. I want to be very near home going down hill. In the spring of 1999, I noticed that the car's range was very bad. An instrumented test run showed that the battery capacity had dropped to about 21 amp hours. The batteries were shot! A little research showed that batteries last the longest when used frequently. Exactly the opposite of my driving style.At best, I'd drive it once or twice a week and charge it the next day. More often and during the long rainy season, the car was undriven and charged every other week. Very bad for the batteries! So, the EPorsche is off the road and it fate uncertain. I can't afford a new set of batteries. Best so far (5/17/97), 15.1 miles. The end point for range is rather subjective. Near the end of the charge, performance drops off fairly sharply but the car will still go, albeit slowly, for quite a while. Poor range thought to be due to wheel/brake drag. At least 50 mph (observed going up a slight hill in a 35 mph zone). The 120 volt upgrade added about 215 pounds for a new total of 2955 lbs. Goodyear Eagle GA Radials, size 195/65R15 inflated to 40 psi. Ten U S Battery U1450L Lead Acid Deep Cycle 12 volt batteries wired in series for 120 volts nominal. Installed in three locations. Four batteries are in a box in the front where the fuel tank and spare tire were located. Four batteries are in a box inside where the rear seats were located. Two batteries are in the engine compartments. The battery boxes are forced air ventilated during charging. Recharging takes 8 to 10 hours. Large (9") Advanced DC Motors Inc. part number FB1-4001 series connected 120 volt DC motor rated at about 85 horsepower peak, 25 horsepower continuous. Curtis PMC 1221B-7401 MOSFET transistor motor controller limited to 400 amps maximum and one-hour rated at 150 amps. This is a pulse width modulation type (PWM) controller operating at 15 KHz and is now somewhat obsolete. Its been over three years, you know. K&W Model BC-20 charger with a Model LB-20 line booster. Constant current charging to gassing point then contant voltage to finish. No transformer so is small and light.